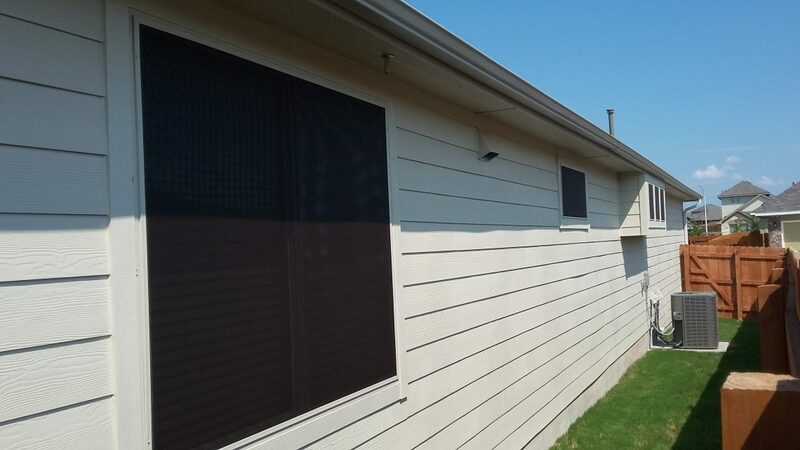 This is a solar window screen installation example for a home we serviced in Leander, Texas. 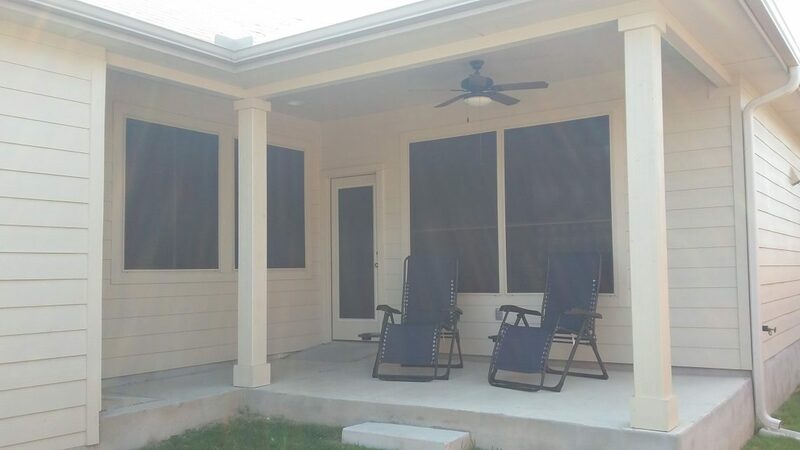 Call Austin Shade Team today to get started on your own custom solar window screen install. 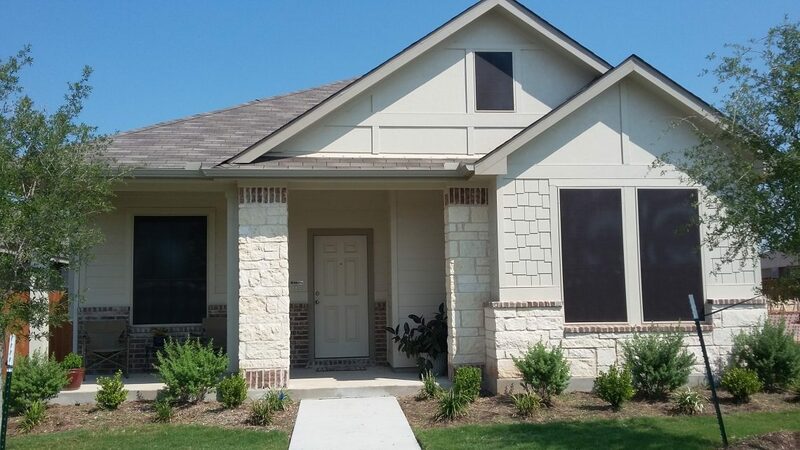 For this Leander, Texas home, we installed 17 solar window screens in order to help with its energy efficiency, temperature control, and more. We used our brown chocolate fabric with tan framing. The tan framing is a perfect color match to the window framing. This customer chose to put the 80 percent solar screen fabric on all of their windows with the exception of these two front windows to the right side. For these two front windows to the right, the customer chose to use the 90 percent solar screen fabric. The customer chose to use this 90 percent solar screen fabric because this particular room gets beaten down by the sun, and the darker fabric will aid in cooling the room much more efficiently. The customer told us that it was this room that is the hottest part of the house, therefore the customer wanted this room shaded a bit more than all the rest of the windows. 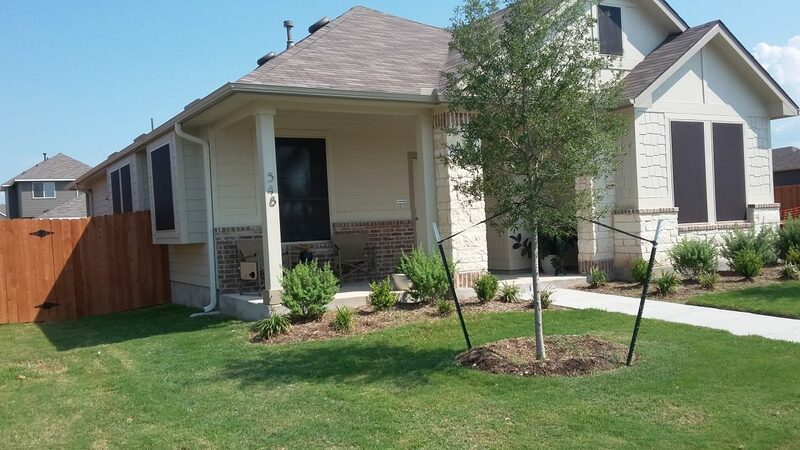 Leander TX Home, showing front of home, 4 80% sun shade screens on front of home. This is a great picture here for this Leander solar window screen installation. We used the 90 percent fabric for the two bottom right hand windows. Those windows are 35 by 70 inches in size. Take a note of the dormer window, that’s the second floor window. You will see that this customer chose to put an 80 percent solar screen on that dormer window. Many homeowners will choose to exclude these dormer windows. However, imagine what it would look like if the front of this home did not have a solar screen on that second floor dormer window, but had solar screens on all of the other windows. The home would have looked odd, and it would have been something that would have jumped out at you as you pulled up to this house. I recommend to people all the time, that they get solar screens for all the windows on the front of their home, not just a window here or there, or all but a window or two. It looks so much better if the front of the home is covered in its entirety, rather than scattered about. Front of Leander TX home showing how we at the Austin Shade Team put a solar screen on the Dormer window. This is a shot showing the right side of the home. We used our 80 percent solar screen fabric for this side of the home. This solar screen here, the first one you see to the left, is a huge window sun shade. This solar screen is 70 inches in width by 58 inches in height. You can tell if you look closely about 4 inches from the top there on the left hand side of the screen, you will see where we attached the screen to the window framing, using our small screws. Because these are vinyl windows, they are not made to accept full size screens, therefore you have to surface mount the solar screens by directly screwing them to the window framing. There is absolutely nothing wrong with direct screwing the solar screens to the window framing — that is, if you know where to screw them at and onto the window framing. We always screw our solar screens to the outermost edge of the window framing. Never do we screw them in anywhere close to the glass. That’s the difference you get when you trust the professional solar window screen experts at the Austin Shade Team. Right side of this home. Will used the 80% solar screen fabric. This customer chose to put the solar screens on all of her windows. This is a brand new home which was barely a month old when we put the solar screens on these windows. She was a previous customer who received solar screens on her previous Leander home and wanted solar screens on this new home of hers. She knew from experience not to leave any windows uncovered. She even put a solar screen on that back patio door. As you can see that back patio door is secluded, likely does not get any sun, but because she is experienced, she knew what she wanted because she has solar screens on her previous home. She knew that she wanted a solar screen on all of her windows to include that back patio door. If this patio was facing west, it could have benefited from our patio sun screens. Back and left side of this home. All windows including that back patio door received solar screens. The left side of this home, which is the right side of this picture, had horizontal sliding windows. These are large horizontal sliding windows that we’ve built large solar screens for. If you’re interested, you can take a look at some more pictures of the sun shade screens for windows we offer. And remember, when it comes to solar window screens in Leander, Austin, or anywhere in the surrounding area, the only name you can trust is Austin Shade Team. Call today.